There's Adam and there's Darby. There's the bookworm and there's the artist. I really LOVE the difference in their voice and in their worries. First there's Adam who suffers from fatal arrhythmia. Every single day he wonders if he'll just collapse and die. He's highly conflicted about receiving a heart donor because it means someone has to die to save him. Then there's Darby who's the twin sister of Daniel, the perfect kid - with good grades, good looks, pleasing personality, and popularity. Every single day she takes the scolding of her teachers and parents. She's the black sheep of the family. I LOVE the difference of their voices. I think that Diamond was able to channel both Adam's and Darby's problm without exaggerating it or making them sound annoying. Reading their stories and their feelings basically make me go 'awwww'. They felt so natural. Thumbs up to Diamond's writing. Right from the beginning, I found both Adam and Darby relatable. They relate to me in entirely different ways and relating to both made me tear up on almost every chapter!! This is true, friends! I kind of hate reading this in public (or with friends/family) because I end up holding back tears WHICH IS SUPER SUPER DIFFICULT!!! I may just be your annoying emo kid but I had the same thoughts as them waaaaay back then. I'm an adult now. Had enough life realizations. I cried. You'll cry. We'll all cry! It's not just about relating to both of them. The nature of the story is so heartbreaking. Read the blurb and you'll know that it's going to make you cry. or sad. or make you tear up. While the story gave that predictable feel, it never crossed my mind to bring it down simply because: (1) I like heartbreaking stories, (2) I immediately connected to Adam and Darby, (3) the writing basically held me until the end - it had that amazing pull that stops me from putting it down, and (4) they both make me want to hug them so tight and tell them that there's nothing to worry about, people love them, people care about them, And I want to help them embrace life and its unfairness (I AM BEING TOO ATTACHED TO THEM!! OHMYGOSH!). I checked and Laura Diamond is a 'board certified psychiatrist.' So I'll tell you this: she knows what she's saying. Adam's delusions (the voices in his head) basically scared me - they felt powerful, I felt his pain and his struggle. The ending made me smile. OVERALL, Under My Skin is a heartbreaking contemporary novel about embracing life despite its unfairness and learning that opening up to people is the first step to helping yourself. I was able to relate to both Adam and Darby and I really felt so much for them! 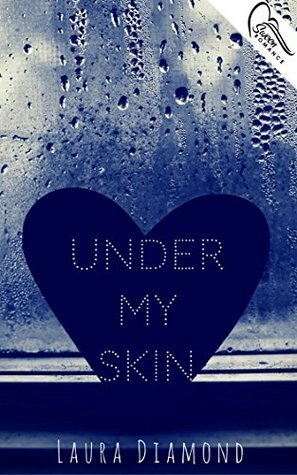 Under My Skin is a highly recommended YA contemporary novel especially those who likes heartbreaking stories and those that involves mental illness (a bit of depression here!!). Do you like reading books with heartbreaking stories? - those that involve topics such as death, depression, illnesses, etc.? If so, can you tell me WHY DO YOU LIKE CRYING SO UCH? (lol. no.) I mean, can you tell me why you like reading heartbreaking stories? What topics do you prefer?